The holidays are over and now everything’s getting going again. For many students, this is the big exam week. Meanwhile, on Friday we will hold the traditional freshers reception to welcome new students before the semester starts formally on Monday. The world around us is full of uncertainty. Will we have a new government tomorrow, and what sort of research and education policy will it pursue? What will happen about Brexit in the end, and what will the consequences be? 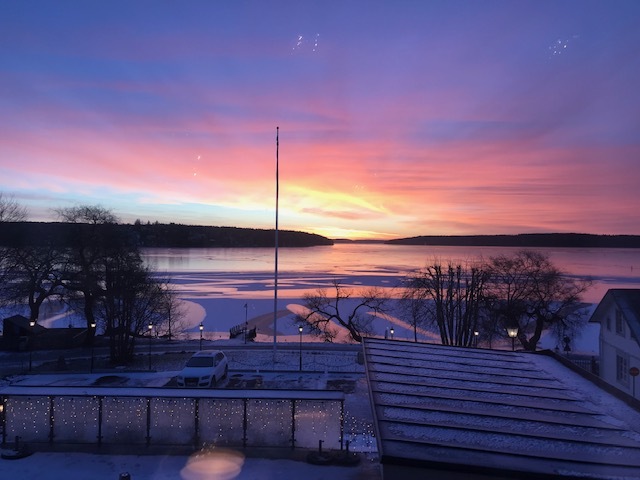 The lake at Sigtuna was looking at its best when the Management Council met there on Tuesday to Wednesday to plan for the year ahead. The vice-rectors told us what’s going on in the disciplinary domains. The students presented their priorities and we looked at developments in the national and international arenas and what we are working on at University-wide level. We discussed which issues are most important to concentrate on if we want to lay the foundations for the University’s long-term development. Some of the issues near the top of the list are autonomy, integrity and self-determination, as well as how to ensure strong public confidence in the University. The issue of our own capacity for renewal is similarly important. To serve the society we are part of, we must keep in touch with our surroundings and be prepared to constantly re-examine and renew both our education and our research. The greatest challenges in our world have to do with sustainability in a broad sense of the word, but the defence of the open society, democracy and civil rights and freedoms has also become an increasingly relevant objective for universities in the world today. We had a session on the ongoing revision of our “Mission and Core Values”. Committees, strategic councils, the students’ unions and the doctoral board have submitted numerous ideas and suggestions and the project group has begun to integrate them into a document that will be finalised during the spring. In the process going forward, preliminary versions will be discussed at meetings with deans and heads of department, as well as with groups of staff and students, external partners and international advisers. We discussed Open Access, more specifically Plan S, as it is known. A number of European research funding bodies, including the EU, are seeking to force a change in the business models used by academic journals, from a subscription-based system to a system in which authors pay a publication fee, after which their articles are made freely available to all. One consequence of Plan S is that, starting in 2020, researchers who receive support from affiliated funding bodies will have to publish in journals that offer – or intend to offer – Open Access in accordance with this model, which far from all leading journals currently do. In Sweden, Forte, Formas and Riksbankens Jubileumsfond have joined the coalition behind the initiative (which is called cOAlition S), while the Swedish Research Council has chosen to remain unaffiliated for now. We share the Swedish Research Council’s wait-and-see approach to this issue. Though the objective is laudable, the timetable is too radical and the consequences have not been adequately studied. There is an obvious risk that researchers will be caught in the middle in the short run. We used part of the away day for our own skills development, under the heading of time and time use. How do we use our working hours? How can we find enough time, and how can we work more efficiently? Most of us have access to powerful digital tools in our computers that we only use a fraction of because we never take the time to learn properly how to use them. We learned how to avoid being ruled by our email inbox by adopting a structured way of working with calendars, email and to-do lists. We also touched on how to save one another’s time by good email culture: one item of business per email, a clearly specified topic in the subject line, short messages, no irony, cc only those who really need the information, and avoid “Reply all” as far as possible. And complicated issues, discussions and particularly conflicts should never be dealt with by email at all. Make a phone call instead or arrange a short meeting. For many of us participants, it was an instructive and practically transformative session. Your now time-conscious and efficient management wishes you a happy new 2019!